What’s the overall theme behind next year’s base layer? We celebrate our tenth birthday in 2019 and our base layers still reflect our brand DNA, which is using Merino wool as our sustainable foundation to create performance apparel without compromising on style. For us, inspiration comes from our three brand hubs in Wanaka New Zealand, Innsbruck Austria and Whistler Canada. The hubs serve as offices but also give us a deeper connection to the community, with ambassadors and close connections with our fans. We are also talking more with our fans and recently did a deep dive of research in Europe which has helped hone our offering. One example of this was to find out how our fan was using a mons baselayer away from the snow. What this showed is that even though the product was bought in winter through a snowboard shop, its getting used everywhere from hikes to MTB. This has helped us become our retail partners most loved brand in the shoulder season by driving a greater connection to their customer because we have an offering that is going to add value before the snow falls, allowing them to ride their bike into November or run the streets at night. 1. Our warmest baselayer the Olympus which is a 250 gsm merino. 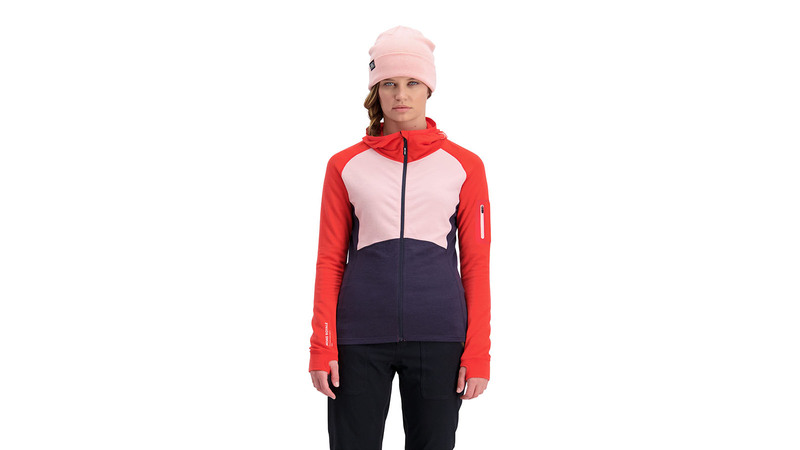 We have updated the hood piece with a scuba pullover which will make it a favourite for those deep powder days. The men’s line has a strong new look which really has the Mons DNA. 2. A new lightweight mid layer, the Ascend which works to extend our baselayer program through a lightweight terry knit. This ensures high warmth to weight ratio and is extremely breathable, making it the midlayer you’d choose for the majority of days. 3. Neckwear and Balaclavas. We believe we have the best offering, and it’s such a good gateway to get people off the petrochemical synthetics and into merino wool given that it’s only a beer or a couple of coffee’s more in price. FW19 sees us continue to drive with colour and energy to accessorize our fans outfits from the resort to the backcountry. What percentage of your base layer is sold online vs instore, both by yourselves and your retailers? What’s the best way to connect with customers who buy via these different channels? Our digital platforms from Instagram to our website have the best experience of Mons Royale, for researching, buying and for inspiration. Where people buy online vs offline differs by the market, and often it’s not totally known with omnichannel retailers but essentially Mons is strongest at the place of experience which is the mountains, so it’s the physical purchase which first gets the fan. Our price points are fairly stable as we have long term contracts with ZQ our wool partner which help secure price, quality and transparency. Nothing new, but what we know from talking to our fans is that many of them will own both a slim baselayer like Bella which is an active base layer and a Yotei which is a relaxed fit base layer. This we believe is fairly unique in the industry and its because we know our fan base and what they are looking for. We have an all-over print in our wms bella line and a new camo for the Mens. And we continue to work with the power of pop with our trims and graphic colours.